Before the birth of a child, oxygen is provided by the placenta. Many of the infants, immediately after their birth, require some help to breathe. A few of them require extensive resuscitative steps, the need of Neonatal Resuscitation, an intervention that helps a newborn to breathe as well as helps its heart beat. 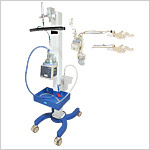 GPC, internationally reputed manufacturers, offer a wide range of quality Neonatal Resuscitation Units, being regularly exported to many different countries. Send Your Buy Requirement For "Neonatal Resuscitation System" AND Get Quote Quickly.